We still haven't decided where we will roam to this summer to make sure CiCiBlue is up to the big travel. I know she's excited as we are!! Diesel Pushers are meant to go. So where are we now on stuff. My art stuff. Ok, I need a home for everything, But where? Yesterday I emptied out a closet space and put in my watercolor stuff. Bag on bottom left. Put all the unfinished boxes in a box since they will be painted and shipped soon. On my side of the closet at the back of the coach, I have the safe, then a small shelf to place something on. I put velcro on the bottom of that box, it holds various scarves, and you never know when one needs to flow with grace across an RV park. (deer in headlights face here). Then I stacked my canvas on top. And yes, it will move while we roll, so a snug strip of velcro around said canvas hopefully will do the trick. The bathroom project is moving along. Today was placing the foam insulation and sealing everything to get ready for the board over. I ordered stick on tile and that should be coming in today. I'll do a show and tell tomorrow on it. I liked it in the photo, hoping I like it when it's in my hands. And..In Progress!!! 20" x 20" oil on canvas. A real Texas boy sitting happily in flowers. I have lines around for correction and direction. 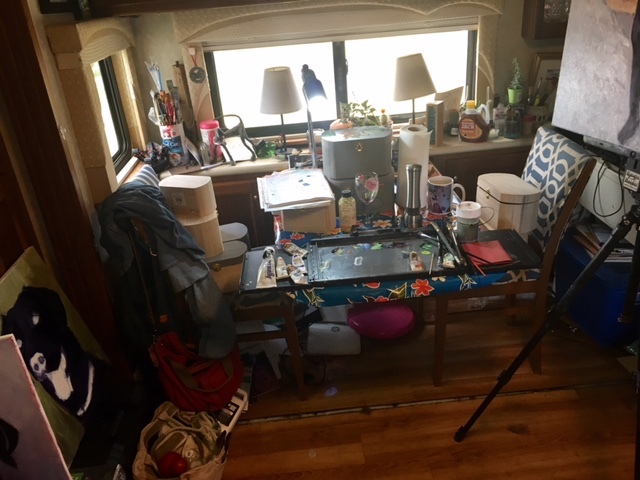 Thought I'd be getting to this today but after my great arrangement of my canvas, I closed the mirrored doors and something was stopping the doors from ever opening again. After trying to dislodge whatever it was with an umbrella I grabbed a screw driver and started to unscrew the bottom strip of wood holding the door on the rail. Three screws were considerate, 5 were not. I was finally able to open one side large enough to get my hand and arm inside and that's when I felt the 20" x 20" canvas leaning against the door. "Oh for crying out loud" was what I did not say...then got back on the floor to rescrew the three screws back into their place. This was an hour and then I had to re hang all the clothes I took out of the closet in hopes that maybe a sleeve became jammed. 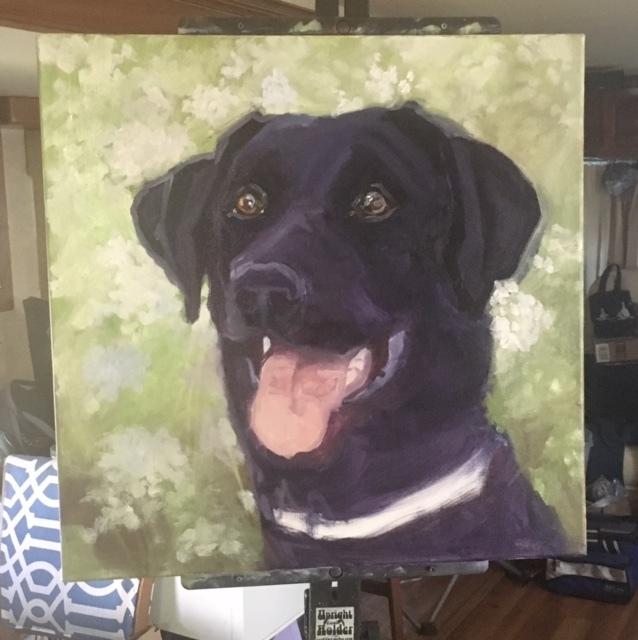 Ok, the positive out of this, I threw out a lot of things I no longer wear, need or even remember that I had and oh, found that 20" x 20" canvas that hasn't been finished. So that's where I put it.!! It's been really gusty here lately and allergies have been kicking up for everyone. Itchy eyes, sneezing, runny noses. We are quite a group. Ok, have a great rest of the day, I think I'll go take a little snuggle with dogs!! See you tomorrow.